Please visit our Facebook page or our new website for the latest events and updates. Like us on Facebook, and join us on LinkedIn. Happy Holidays! Please join us for our 8th annual Young Professionals in Transportation-LA Chapter Holiday Party in Hollywood at the Te’Kila lounge & eatery. Come mingle with other professionals working in the transportation industry and enjoy yummy food and cold drinks. This is a joint party with our friends at the Association of Pedestrian & Bicycle Professionals (APBP). Please feel free to pass along invitation to all your amigas! See you there! No tickets necessary! All chapters welcome. There will be an extended happy hour till 9pm on food and drinks! Limited appetizers will be provided. Transit Access: 4 blocks west of Hollywood/Vine Metro Station. Join us for food, drinks and good company at Salvage Bar in Downtown LA! This is our standing happy hour that occurs on the third Wednesday of every month. Located above the Metro Red/ Purple line subway at 7th Street/ Metro Center station. We have an exciting event planned for next month, and we want you all to be there – it’s unlike anything we have done before! Have you ever applied to a job and wondered what the hiring managers were thinking? Are you interested in understanding how private sector hiring differs from hiring in the public or nonprofit sectors? Join YPT-LA, the American Planning Association – USC Chapter, and a panel of industry professionals as we demystify the job hunt by providing a look at the hiring methodology of local city planning departments, Metro, Fehr & Peers and more! We will be at Grace Ford Salvatori Hall at USC on Monday, March 9 at 6 PM. Accessible via Expo/ Silver lines. YPT-LA invites you kick off the holiday season with a hoedown straight out of the old west! Join us for food and drinks, games, raffles for YPT-LA and CicLAvia swag, and a chance to mingle with LA’s best and brightest. See you there! Join the LA chapters of Young Professionals in Energy and Young Professionals in Transportation for an interactive panel! We’ll be discussing fuel cells and their applications in transportation technology with representatives from Nissan and First Element Energy. Have questions you’d like to contribute? Drop them here on this event page or message us directly! Join us for drinks and good company at Salvage | Bar & Lounge in Downtown LA. This is our standing happy hour that occurs on the third Wednesday of every month. Catch up with YPTers and get the details on upcoming Board elections! Save the Date: Our 2nd Annual YPT-LA Dodgers outing will happen on Wednesday, September 10th. Stay tuned for details, including prices, how to pay, and a possible pre-game group ride on the Dodger Stadium Express shuttle and discussion of recent bicycle & pedestrian improvements around the stadium. On August 28, YPT-LA and APBP-SoCal are joining forces to bring you a free walking tour of the new Broadway Streetscape Dress Rehearsal project with LADOT’s Pedestrian Coordinator, Margot Ocañas. Mark your calendars for Wednesday, August 20th! This will be YPT-LA’s first Standing Happy Hour, which is a monthly tradition we’re starting that night. We’ll be meeting at 5:00pm at Casey’s Irish Pub in Downtown LA for drinks, networking, and great time!! If you ever wondered how Metro Rail trains are coordinated and operated, now is your chance to learn what it takes to keep the system running smoothly. Join YPT-LA for a great opportunity to learn more about our rail system! A group of us will be meeting at Los Angeles Union Station at 9:30am to leave towards Willowbrook Station (off Metro Blue/ Green lines) at 10am. Of course, you can also just meet us directly at the ROC at 11am. Lunch to follow in downtown Long Beach. Please join the LA chapter of Young Professionals in Transportation for an evening of friends, fun and craft beers aplenty! On Wednesday, April 23, we’ll descend upon Melody Lounge in Chinatown for a rowdy good time. Be advised it is cash only. From Union Station take the Metro Gold Line one stop north to Chinatown Station, then walk 2 blocks west to Hill St. The local APBP (Association of Pedestrian and Bicycle Professionals) chapter is gathering on April 17th for an informal happy hour/mixer to meet other active transportation professionals from around the region. The get together will be hosted by Alta Planning + Design at their Downtown LA office (448 S. Hill Street, Los Angeles, CA 90015) in the “Decompression Room” on the 3rd Floor, from 5:00 to 8:00 PM. Beverages and light snacks are on Alta! Just stop by and hang out. Please RSVP to ryanjohnson@altaplanning.com (or the Facebook event page) so we know how many drinks and bags of chips to purchase. As you enjoy exploring Wilshire Blvd. 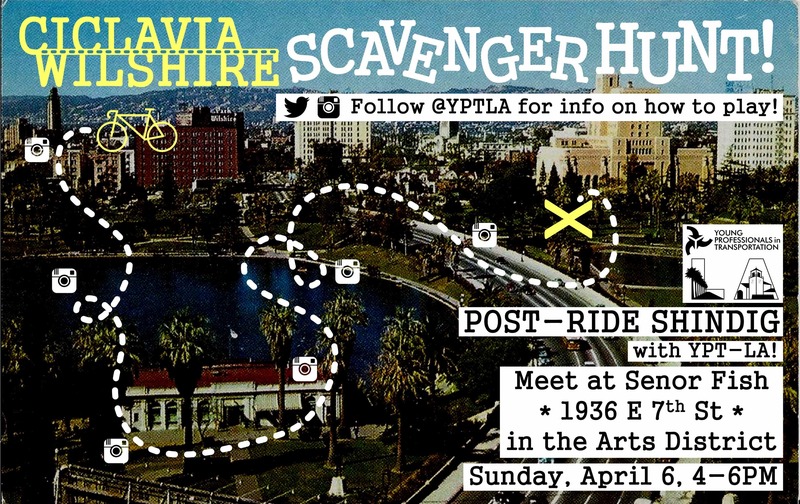 this Sunday, take part in our scavenger hunt! Check @YPTLA on Instagram and Twitter to learn how to play. There will be prizes for winners! (Updated) After CicLAvia come to Pour Haus in the Arts District (1820 Industrial St., Los Angeles, CA 90021) after CicLAvia to hang out and relax with other transportation enthusiasts! (From 4-6pm) – Do not meet at Senor Fish. As the region progresses from an array of disparate communities into a dense and interconnected metropolis, we face increasingly complex transportation challenges. At the same time, advance in technology are presenting new opportunities for transportation professionals. Accelerate Los Angeles will be an engaging discussion of big ideas, creative problem solving, and cutting-edge technology with current and future leaders in the tech and transportation fields. For more info, check out our Facebook event page. Join us on Thursday, June 13 at 4PM for a tour of the Los Angeles Department of Transportation’s Automated Surveillance and Control (ATSAC) led by Zaki Mustafa, Executive Officer – Project Delivery. Following the tour we will convene for a Question-and-Answer session with Mr. Mustafa about LADOT and his 28-year career there. Please RSVP for the tour soon by clicking here! ATSAC is a computer-based traffic signal control system that monitors traffic conditions and system performance, selects appropriate signal timing (control) strategies, and performs equipment diagnostics and alert functions (http://trafficinfo.lacity.org/index.html). ATSAC is located at 210 North Main Street in City Hall East (across the street from the 1928 City Hall Building). Please meet at the security desk at the west entrance on Main Street between Temple and 1st Street. We will sign in at 4PM. After the tour we will head over to Far Bar (347 E 1st St, Los Angeles, CA 90012) for drinks and conversation with Mr. Mustafa. 5/11/2013 – Special Getty Tour for YPT-LA members! 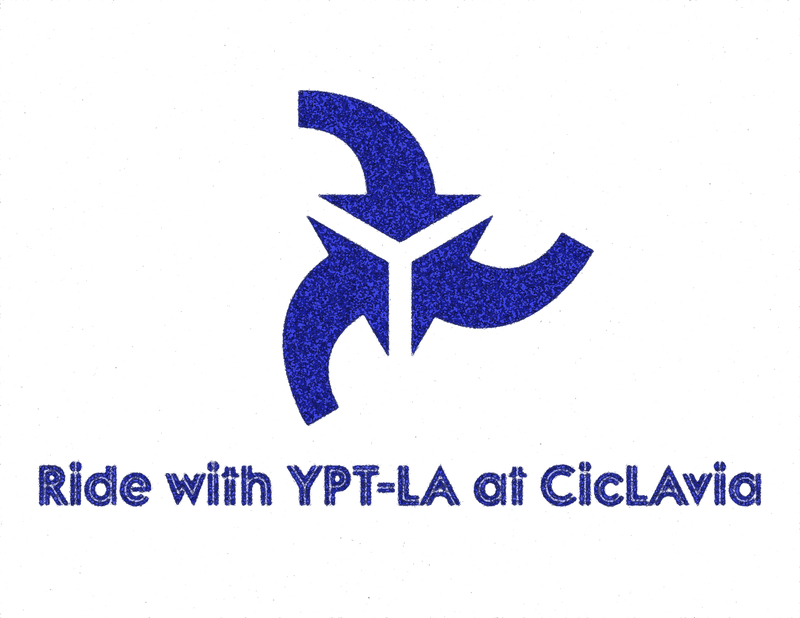 4/21/2013 – YPT at CicLAvia! CicLAvia makes the streets safe for people to walk, skate, play and ride a bike. Last Sunday, April 21st, YPT-LA rode from Culver City west to the Venice Beach. We met at the Culver City Hub at 11:30am and put the pedals to the pavement around noon. We wore our YPT blue! 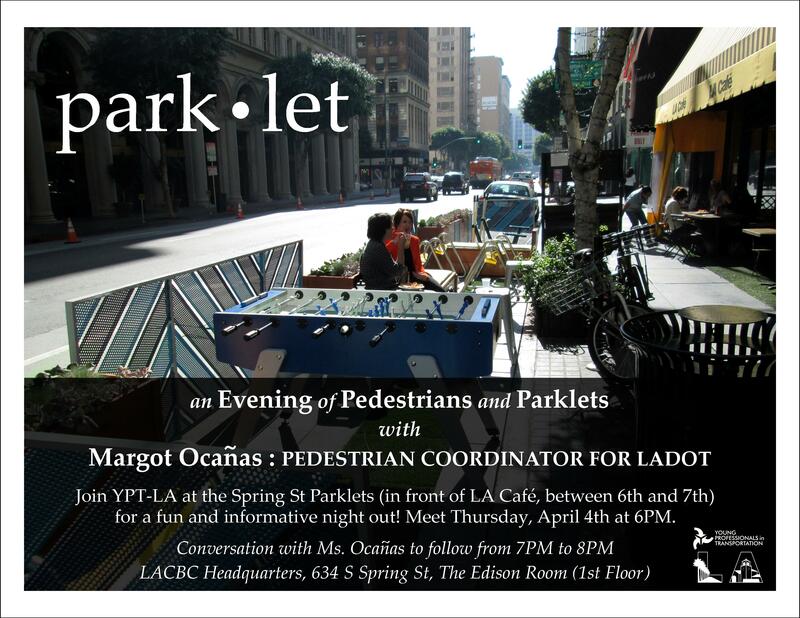 Tour the new downtown LA parklets and hear firsthand about pedestrian topics from Margot Ocañas, Pedestrian Coordinator for the Los Angeles Department of Transportation. Description: We were at the studio of Diego Cardoso, urban artist and Executive Officer of Countywide Planning at Metro, for an evening of colorful, Los Angeles-centric art highlighting transportation infrastructure. Description: Join us at the Doubletree Hilton (formerly the Kyoto Grand Hotel and Gardens) lobby bar at the conclusion of the Complete Streets Conference. Catch up and unwind with conference goers and other transportation professionals at this informal event. All are welcome to attend. Inspired by the complete streets theme, a special “Walk this Way” cocktail will be available at the bar for only $6. Throw your business card in the basket and you might win a free drink! This was a great opportunity to learn about the transportation industry first-hand from LA young professionals!